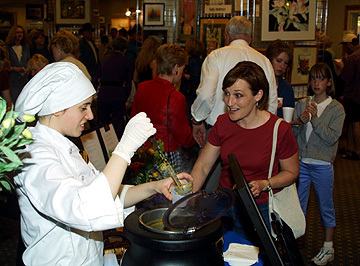 With fine food for the taste buds and fine art for the soul, Art & Soup has become an annual tradition for hungry Utahns. This April saw the most successful Art & Soup event yet. Now in its fourteenth year, it is the major annual fundraising effort of Community Nursing Services (CNS). Established in 1929, Community Nursing Services is the only freestanding, not-for-profit, home health care and hospice agency in the state of Utah.Each spring the three-day event brings together outstanding Utah artists with Salt Lake¹s finest chefs to raise funds for its home health care and hospice programs. According to Sherri Harrel, the 2002 Art & Soup Volunteer Coordinator, 42 participating artists, 21 restaurants and over 113 sponsors and supporters gathered this year to taste the culinary delights and enjoy the diverse artwork. Included this year was an exhibit of the fine works of the 2002 Award winners of the Springville Museum of Art¹s Annual all-state high school art exhibit. In addition, a colorful display of painted masks created by a group of Special Olympians was on display and available for purchase. The highlight for many attendees each year is the “Artist’s 45-Minute Quick Draw.” Each day during the event, artists created, matted and framed wonderful original pieces on-site, in a mere 45 minutes, and with an audience. The pieces were then auctioned after completion, with 100% of the proceeds going to the CNS Foundation. Among this year’s artists were: Russell Case, Glen Hawkins, Jon Johnson, David Koch, Shanna Kunz, Rebecca Lee, Robert McFarland, Cheryl Merkley, Tom Mulder, Robyn Munro, Carl Oelerich, Sandi Olson, Gwen Peine-Toomalatai, Bonnie Posselli, Bonnie Scott, Steven Sheffield, Kathryn Stats, Suzanne Storer, Darrell Thomas, Sue Valentine, Larry Wade, LaMar Walbeck, and Yevgeniy Zolotsev. 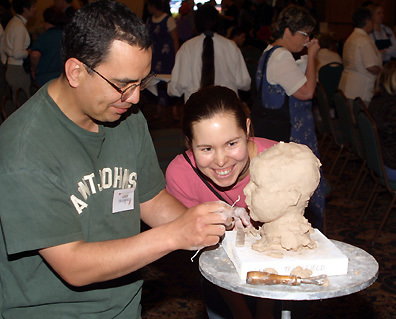 Participating artists for Art & Soup are selected through a jurying process in the fall. For more information about next year’s event, contact the Art and Soup Committee of Community Nursing Services at 233-6100. This article appeared in the May 2002 edition of 15 Bytes.